There was lot of celebrating at every North Escambia area elementary and middle school — all of them received A’s in the Florida Department of Education school accountability grades released Thursday morning. All five North Escambia area elementary schools — Bratt, Byrneville, Molino Park, Jim Allen and Jay– returned to A status for 2011. Bratt Elementary returned to A-status in 2011, up from a B last year. Byrneville improved from a C, Jim Allen and Molino Park improved from a B, and Jay improved from a C.
The news was equally good for Ernest Ward and Ransom, the two middle schools in North Escambia. Both Ernest Ward and Ransom were A schools for 2011 — the sixth straight year at an A-ranking for both schools. The Escambia County School District is now an A-rated district, up from a C last year. And the Santa Rosa County School District remained A-rated for the eighth consecutive year. High school grades will not be released until later this year because graduation rates and other factors are being considered this year and that data is not yet available. Each school is given a grade based primarily upon student achievement data from the FCAT. The grades are designed to communicate to the public how well a school is performing relative to state standards. School grades are calculated based on annual learning gains of each student toward achievement of Sunshine State Standards, the progress of the lowest quartile of students, and the meeting of proficiency standards. The Walnut Hill man accused of starving 10 horses changed his plea to no contest to the charges against him Wednesday. He will be sentenced in August. 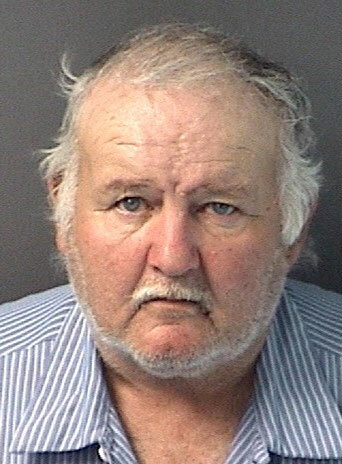 James Benjamin Bethea, 61, appeared Wednesday afternoon before Escambia Circuit Judge Ronald Swanson and entered the no contest plea on two felony and eight misdemeanor animal cruelty charges. He had previously pleaded not guilty. Bethea had 20 horses on his property in the 5000 block of Highway 97A in Enon when Panhandle Equine Rescue arrived to investigate an abuse complaint on February 2. A neighbor told deputies she observed a horse lying in the pasture the previous morning that did not move all day. For more photos from the scene, click here. WARNING: Some readers may find the photos disturbing. One of the horses was so severely malnourished, according to PER President Diane Lowery, that it was euthanized in the pasture by a licensed veterinarian. Another was in critical condition, unable to stand. The thin animal shivered in the February cold and sleet as rescuers worked to load it into a trailer for transport to a veterinarian for evaluation. Nearly a dozen volunteers were forced to push and pull the horse into a trailer as it lay nearly motionless on a tarp. 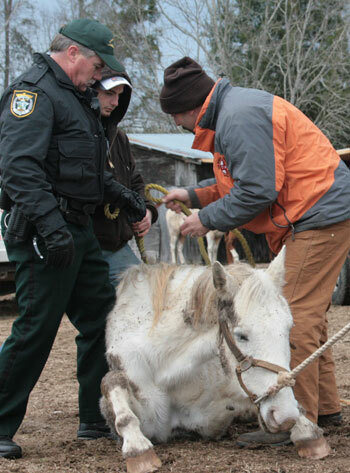 Another eight horses were seized by the Escambia County Sheriff’s Office and taken to a veterinarian for treatment. “They won’t survive the night in this cold and sleet if we don’t get them out of here,” Lowery said as a small army of volunteers assembled with horse trailers to load the animals for transport. An Escambia County Sheriff’s Office Crime Scene unit was called to the scene to photograph the horses and their surroundings, including empty food troughs and old bathtubs that were presumably the water source for the horses. The bathtubs were dry. Many of the horses gathered around a fresh roll of hay that, according to Lowery, appeared to have been placed in the pasture sometime Wednesday. Other horses, bones clearly visible under their skin, stayed away. Another horse gently nudged volunteers, seeking attention and closely following those that would rub it on its face. 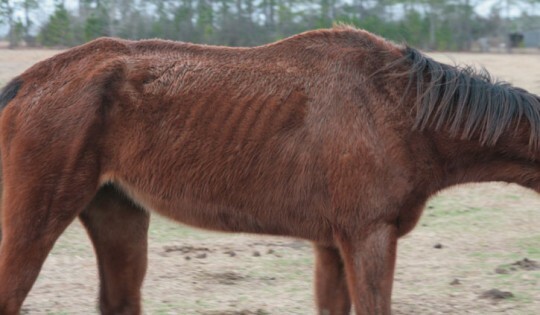 Pictured top: One of nine horses being seized last February in the Enon community. Pictured inset: This horse was in critical condition, unable to stand even with assistance. 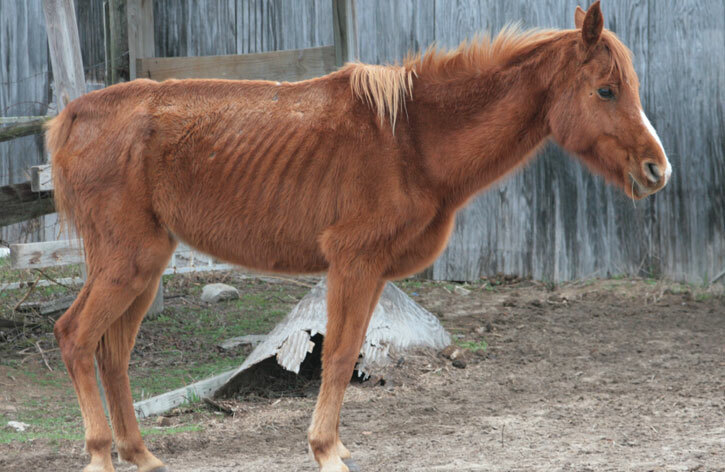 Pictured below: Another of the seized horses. NorthEscambia.com exclusive photos, click to enlarge. 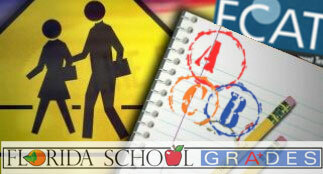 School grades will be released this morning by the Florida Department of Education for elementary and middle schools. NorthEscambia.com will post the school grades for the schools in the North Escambia area later this morning. A stabbing victim that sought help at a Century bar in late 2009 was arrested Wednesday on an outstanding failure to appear warrant in the case. Reginald Lee Williams, 25, of Washington Street, Flomaton, was charged with affray, riot or unlawful assembly and battery in connection with the December 27, 2009, incident. He was scheduled for an arraignment hearing on November 23, 2010, but failed to appear before Judge Joyce Williams, according to court records. 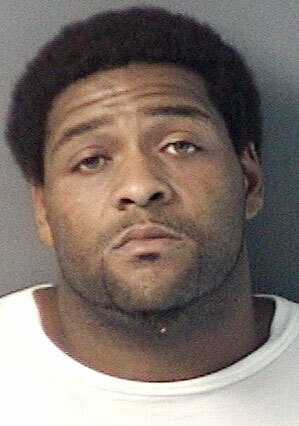 Williams was booked into the Escambia County Jail Wednesday morning with bond set at $3,000. Emergency workers were called to Odom’s Bar at 9520 North Century Boulevard about 12:10 a.m. December 27, 2009, after Williams was reported to be stabbed. Reports indicate that Williams was stabbed nearby on Ivey Street and walked to the bar for help. Williams was transported by ambulance to Jay Hospital where he was treated for minor injuries. Dusean Labradford Phifer of was arrested the morning of the incident and charged with felony aggravated battery and charged with being involved in an affray, riot or unlawful assembly. Charges against Phifer were later dropped by prosecutors. According to arrest reports, both men agreed to fight one another after an argument over Phifer’s cousin, who was Williams’ girlfriend. 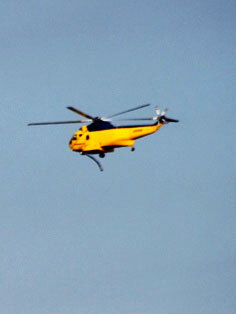 The Jones Swamp wildfire that has burned in southwest Escambia County since Sunday is now completely contained. 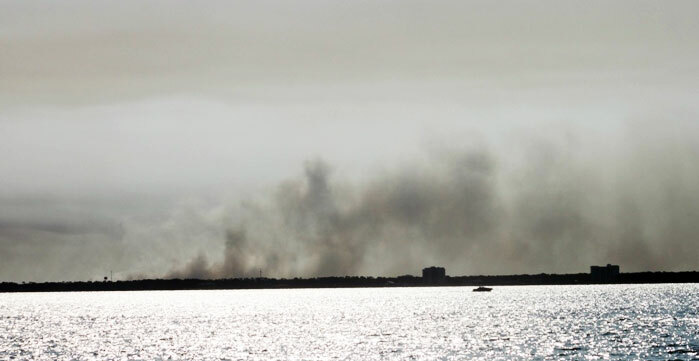 “Some smoke may remain in the area for the next few days but rain and four days of tractor work have provided containment,” said Joe Zwierzchowski, spokesperson for the Florida Division of Forestry. The Division of Forestry will continue to monitor conditions at the swamp, he said. The 170-acre wildfire created smoky conditions and rained ash into North Escambia on Sunday, prompting Escambia County officials to issue a health alert for residents will breathing problems. Hustling to make a Friday deadline, state social service officials met Wednesday to map out and get last-minute public input on broad policy guidelines as Florida begins drug testing new applicants for welfare benefits. Following up on legislation passed by lawmakers only a few months ago to require applicants for temporary financial assistance to take drug tests, Department of Children and Families officials said formal procedures would not be ready until mid-July at the earliest but the agency would proceed nonetheless to administer the new law. Among a litany of concerns from stakeholders, including Florida Legal Services and the ACLU, were questions of whether applicants who test positive for drugs would be immediately flagged by DCF and risk having their children removed from their custody. On Wednesday, DCF Program Policy chief Nathan Lewis said that a positive drug test would not automatically result in a knock on the door by DCF investigators, but he also said that substance abuse and child welfare investigators would likely be privy to final test results, which if positive would be referred the Florida Abuse Hotline. The law is silent on whether a positive drug test would result in the removal of children from the home. Lewis said agency rules, however, would allow other DCF offices to use the data for their own purposes, including determining whether children are safe in the home. Though specific procedures will be hammered out after a July 12 workshop on those technical issues, the program’s framework is pretty much in place. Under the proposed rules, applicants who have met other conditions for temporary cash assistance – income and asset requirements and citizenship, for example – would be notified that they must also submit to a drug test within 10 days. If an initial screening, the results of which would be immediately available, turns up positive, applicants will have the option of taking a second test within that 10 day window to refute the initial screen. DCF would not release drug test results to other state offices until after all procedures are complete or applicants drop out of the process. Numerous details have yet to be worked out, including how confirmation tests will be evaluated and who pays for the additional analyses. Agency staff estimates the cost to applicants for all testing and reviews would be between $28.50 and $40. Initial screens, purchased alone, would cost between $10 and $36. “We’re asking as you go forward with rulemaking decisions to give some consideration for someone who wants to comply but cannot come up with the upfront costs,” said Valory Greenfield, attorney for Florida Legal Services. The law makes no provisions for economic hardship, so applicants will be required to pay for the tests themselves. Applicants who test negative will be reimbursed for the cost of the test. Beginning July 1, applicants who test positive for drugs would be denied benefits for a year. A second failed test would result in a three-year ban. Recipients who complete a drug rehab program can re-apply in six months. Existing recipients of financial assistance would not be required to be tested unless they become ineligible for other reasons and must reapply. In two parent households, both adults would be tested. Benefits to children could be awarded to a third party recipient, who must also pass a drug screen. The law will not affect the federal food stamp program. Federal law allows states to screen for drug use under the TANF program, which provides a maximum of $300 a month in cash assistance to needy families. The program, which replaced traditional welfare in the mid 1990s, has a 48-month lifetime cap on benefits. Former Walnut Hill businessman Marvin Schneider passed away Tuesday in Fountain Run, Kentucky. He was 80-years old. Schneider owned the Walnut Hill Farm Supply from 1984 until it was sold in 1997. He was also an active member of the Walnut Hill Volunteer Fire Department from 1984 until 2001. Funeral services for Marvin Schneider will be held Saturday, July 2 at 10 a.m. the Walnut Hill Mennonite Church. Visitation will be held from 6-8 p.m. Friday, July 1 at Johnson-Quimby Funeral Home in Atmore. Football season is approaching fast, and registration is set for two local leagues. Registration for Northwest Escambia football will begin July 2 and continue every Saturday through July from 10 a.m. until noon at the Ernest Ward field. Participants are encouraged to sign up early. The first practice for NWE is August 8. For more information, contact Charles at (850) 327-4603. Football and cheerleading registration for the Cantonment Cowboys will be held each Saturday through July 30 from 10 a.m. until 1 p.m. For more information, call (850) 292-1775. The 9-10 Tri-County All Stars advanced in tournament play Wednesday night, while Northwest Escambia was eliminated. The Tri-County 9-10 year olds lost their Florida District 1 Little League playoff game to Niceville Maroon Wednesday night, 7-3. Tri-County remains alive in tournament play in Shalimar, facing Niceville White Thursday at 6 p.m. It will be the second meeting between the two teams; Tri-County defeated Niceville White Monday night, 2-1. Defuniak Springs defeated Northwest Escambia 12-2 Wednesday night in Niceville, eliminating NWE from Florida District 1 Little League 11-12 year old tournament play in Niceville. Tri-County’s 11-12 year old All Stars remain undefeated in the tournament as they head into a 7:30 p.m. Thursday game against Niceville. About two dozen children took part in a “Water Camp” Wednesday at Lake Stone in Century. 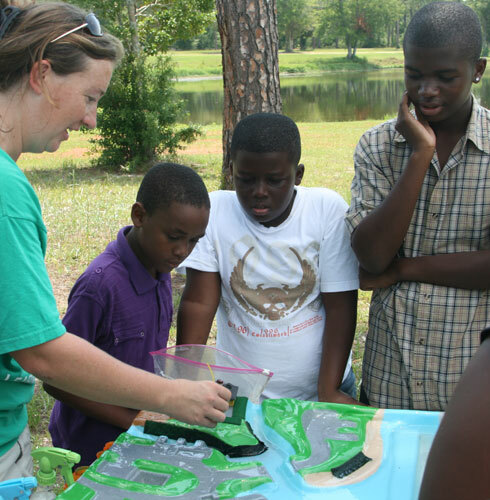 Water Camp featured fun, hands-on activities designed to get kids excited about water resources and healthy lifestyles. There was also plenty of a watermelon, water balloons, water guns, a water slip-n-slide and other water-related activities. The event was sponsored by Escambia County Extension. Pictured top: Getting hit by a water balloon a Water Camp Wednesday morning at Lake Stone. Pictured inset: Learning about water flow and erosion. Pictured below: Water Camp participants learn about the necessity of water in life. NorthEscambia.com photos, click to enlarge.